Bio Notes: John James Stevenson was born in Glasgow on 24 August 1831, third son and sixth of the ten surviving children of James Stevenson (1786-1866), then a Glasgow cotton broker. His wife and the mother of all of his children was Jane Stewart Shannan whose parents were ship-owners in Greenock. The Stevenson family had originally been farmers at Dalziel, Lanarkshire, one of whom James Stevenson (died c. 1772) had become a wright in Paisley by the early 1730s. The founders of the family fortunes on which John James Stevenson’s architectural practice was to largely depend were James’s sons Nathaniel (1732-1824), a Glasgow merchant, and James Stevenson (1738-1806), a Paisley silk manufacturer and John James’s grandfather. In 1843 John James’s father James Stevenson left the cotton business he ran with his brother Nathan to become managing partner in the newly-founded Jarrow Chemical Company’s alkali works. This was primarily a Stevenson family venture in which John Tennant of his brother William’s firm Charles Tennant Sons & Co. was a minority shareholder. James’s eldest son the chemist James Cochran Stevenson joined him in the business, followed by two younger brothers Alexander and Archibald: they became responsible for its management when their father retired to Edinburgh in 1854. By that date James Cochran Stevenson had founded the Shields Gazette in 1849 and had been a member of the Tyne Improvements Commission since 1850. John James was educated at Glasgow High School and at the University of Glasgow’s Old College in 1845-48. At his mother and father’s wish he was to join the Free Church ministry, attending “Edinburgh Theological College” (actually the Free Church’s Divinity Hall, now New College) in 1852-54, but studying for part of that time in Tübingen in 1853. As his father was then still in Jarrow, he shared lodgings with Carstairs Douglas, subsequently a missionary in China, and through him he became acquainted with his architect brother Campbell Douglas. Stevenson’s mother died in October 1854, relieving the pressure on him to become a minister, but a further two years were spent in divinity-related study in France, Italy, Sardinia and Germany, during which he pursued a parallel interest in architecture and sketched whenever he could. In August 1856 he finally resolved to become an architect, inviting Campbell Douglas to Augsburg to discuss the possibility of a partnership. This was agreed in principle subject to his completing an apprenticeship and on the 24th he finally wrote to his father seeking his consent. His father replied giving approval on the 30th, subject to his apprenticeship being with another longer-established practice. After some further sketching in Germany Stevenson returned to Edinburgh to commence a shortened two-year apprenticeship with David Bryce in January 1857. Wider London experience was then sought with George Gilbert Scott in whose office he found kindred spirits in George Gilbert Scott junior, Thomas Graham Jackson, Edward Robert Robson and Robert James Johnson. After a further study tour in Italy with Johnson and a sketching expedition to France, Stevenson finally joined Campbell Douglas’s practice as a partner in the autumn of 1860, opening an Edinburgh office on the top floor of the Edinburgh Life Building at 24 George Street and sharing it with the stained glass artist Daniel Cottier, an arrangement which lasted at least until 1865. Although the Stevensons had good connections the Edinburgh office was never as successful as Douglas’s at 157 Hope Street in Glasgow. Westerlea, Murrayfield for the Cowans – probably designed by Douglas before the partnership commenced – seems to have been the only major work in the office for although Stevenson won the 1861 competition for Barclay Church in Edinburgh the actual commission went to Frederick Thomas Pilkington. Most of Stevenson’s time was thereafter spent on Glasgow business: although the North Leith Free Church of 1858 and Bridgegate Free Church in Glasgow of 1859 had shown that Campbell Douglas had real ability he became content to take on a more managerial job-getting rôle. Stevenson’s first-hand knowledge of Italy and France and his experience with Scott quickly made a big impact on the Glasgow skyline with his Italian gothic Free church at Kelvinside and the French gothic spire of Townhead Free Church at Garngad Hill. The partnership began to attract outstanding staff, including John McKean Brydon whom Stevenson had known in Bryce’s office and William Leiper from John Loughborough Pearson and William White’s offices in London, both in or about 1863. The major houses of these years were the relatively low-key Scottish baronial Auchenheglish on Loch Lomond-side, the first phase of Keil House at Campbeltown and the idiosyncratic red-brick gothic Westoe at South Shields, the last of these being built in 1864 for Stevenson’s brother James Cochran Stevenson: the clerk-of-works there was Thomas Andrew Page from Campbell Douglas & Stevenson’s office. Page settled in South Shields and was to act in a similar capacity for R.J. Johnson who had set up practice in Newcastle, and also for subsequent Stevenson projects on Tyneside prior to establishing his own practice there. Stevenson’s father died in June 1866 leaving him a one-ninth shareholding in the Jarrow Chemical Company. Five years earlier, on 3 April 1861, Stevenson had married Jane (Jeannie) Omond, the twenty-one-year-old daughter of the medical practitioner Dr John Omond, at her parents’ house at 43 Charlotte Square, Edinburgh. The Omonds were a wealthy Orcadian banking family and, like the Stevensons, staunchly Free Church; they had become acquainted through holidays on Arran. The ceremony was conducted by the bride’s uncle, the Rev. John Reid Omond, later (1868) a client for Monzie Free Church at Gilmerton. The honeymoon was an extended one, first in Italy and later at Loch Long, and on their return the newly married couple set up house at 12 Oakfield Avenue in Glasgow’s Hillhead, most of Stevenson’s business being in the Glasgow office. Continental holidays were to be a regular feature of their lives and on one of these (October 1864) Stevenson bought and shipped home the woodwork of a house he saw being demolished in Ypres, the best elements being incorporated into his brother’s Westoe. Although thus already well-off the Stevensons’ fortunes were transformed by the shareholding in Jarrow Chemical Works which brought in an income of £4,000 p.a., rising to £9,000 by the early 1870s. This turned Stevenson’s thoughts to establishing a London practice and as early as 1867 he was in discussion with E.R. Robson about forming a partnership, Robson having found his appointment as City Architect of Liverpool less than congenial employment. In 1868 the partnership with Campbell Douglas was amicably closed for what Stevenson later described as “an interval in the practice of my profession” to think about what modern architecture should be and to begin compiling his major publication House Architecture which was not to appear until 1880. The winter of 1869-70 was spent in Paris and the summer and autumn of 1870 in Broadstairs. Thereafter the Stevensons rented a furnished house in London and in March 1871 they acquired a site at Bayswater Hill on which to build a house of their own. In September of the same year Stevenson and Robson finally became partners, Robson having been appointed architect to the London School Board in July. Like R.J. Johnson, Robson had been brought up in County Durham and the Stevensons had bought furniture from the Robson family’s Durham-based building and cabinet-making firm in 1862. As Stevenson’s relationship with Campbell Douglas and his circle was to remain close his office became the mecca for many of the most promising assistants from Campbell Douglas’s and other leading Scottish practices throughout the 1870s and into the 1880s, those known to us including William Wallace, George Washington Browne, James Marjoribanks MacLaren, William Kelly and most importantly Francis William Troup who was later to play a significant rôle in Stevenson’s practice. Stevenson and Robson quickly became pioneers of the “Queen Anne” domestic revival although the style had in fact originated with Richard Norman Shaw, William Eden Nesfield and George Frederick Bodley some five or six years earlier. But it was Stevenson who became its most prominent exponent with the building of his own Red House on his newly acquired site. It was both house and office, very big and set well back from the street. Its front elevation was asymmetrically designed and wholly of red brick with features which were of artisan mannerist derivation mostly from the reigns of James VI and I and Charles I rather than Queen Anne: Stevenson himself preferred the designation of “Free Classic” describing it as “homely,” “simple and manly,” and likening it to “colloquial speech.” Internally the house had a very grand main stair, library frieze and fittings designed by Bodley (“a man can’t look at his own work all day”), chimneypieces with Delft tiles, and walls hung with William Morris papers and paintings by Rossetti, Orchardson, MacWhirter and Colin Hunter. The Stevensons moved in during December 1872 before the house was quite finished and entertained magnificently: George Gilbert Scott junior, Alexander Thomson and John Honeyman are known to have been among their guests. The free classic asymmetry of the Red House provided a flexible and inexpensive idiom for Robson’s new schools from 1872 onwards, some of them being almost wholly designed by Stevenson. Their Neo-Jacobean artisan classic detailing soon attracted influential criticism, not just from some of the leading gothic revivalists but from the Beaux Arts-trained Richard Phené Spiers at the Royal Academy Schools who feared his students might be corrupted by it. It fell to Stevenson to defend the new idiom in a paper “On the Recent Reaction of Taste in English Architecture” in The Building News and The Builder (18 and 24 June 1874), a further paper on the same subject being delivered at the Architectural Association in February 1875. In parallel with the school building programme Stevenson began to establish a reputation for up-market town-houses in Kensington and Chelsea beginning with 8 Palace Gate, similar in size and style to the Red House in 1873. In the following year he built the very large South Garth at Westoe for his brother Archibald. It was in a much simpler idiom, brick with a sparing use of Scots Renaissance detail for the main doorway and windows which was to be significant in a Scottish context. George Washington Browne probably worked on it as it was to provide the vocabulary for Rowand Anderson and Washington Browne’s stone-built Edinburgh terraces of the 1880s. The partnership with Robson was dissolved in 1876 once the first rush of school provision had begun to slow down. Stevenson then took into partnership Alfred J. Adams who had been a “temporary additional assistant draughtsman” with the London School Board since January 1875 and had probably been hitherto a member of Stevenson & Robson’s staff. Described in the Southwark Diocesan Archives as a “clever Scotch convert architect” Adams had a small Roman Catholic church practice which was kept strictly separate from Stevenson’s. This arrangement lasted until sometime after 1878 when it was dissolved, perhaps due to Free Church pressure on Stevenson over Adams’s Catholicism, but they remained on good terms, Adams continuing to provide Stevenson with perspectives until at least 1880. Munstead House, Surrey (1878) for Sir Herbert Jekyll dates from the latter years of their association, smaller, simpler and more regular in its fenestration than South Garth, and unusually within Stevenson’s private practice south of the Border, it was stone-built. Also stone, but with its brick carstone cut and coursed as if it were brick was the exceptionally well-detailed Ken Hill, Norfolk (1879-80) for the York engineer Edward Green, which reverted to the free classic Neo-Jacobean of the London board schools. It was the last detached house Stevenson built in that idiom, the events of 1877-79 prompting a still more radical rethink of what modern domestic architecture should be. On 22 March 1877 Stevenson was, together with Philip Webb, John Francis Bentley and George Aitchison, one of the four original architect members of William Morris’s Society for the Protection of Ancient Buildings which came into formal existence in the following month. The immediate catalyst was the destruction of high-quality Stuart and early Georgian church furnishing but Stevenson’s interest in the subject was not new. In a lecture to the Glasgow Architectural Society in February 1863 he had railed against “the falsification of historic buildings,” citing particularly the elimination of perpendicular interventions to return Romanesque and earlier gothic church buildings to their presumed original state: “We have no right to destroy it … It is specially English architecture.” As his lecture was given in Scotland where perpendicular work was hardly an issue it had not attracted much attention, but to bring the new Society to wider notice he resolved to stir things up, setting out its ideals in “Architectural Restoration: its Principles and Practice,” a lecture given at the R.I.B.A. in June. It cited examples and named names: not even his friend Bodley was spared as he had replaced the balustraded parapets of Christ Church College in Oxford with gothic crenellations. Inevitably his lecture upset George Gilbert Scott senior – to whom the R.I.B.A. gave the right of reply – and other leading members of that body. Nevertheless Stevenson still commanded enough support to be admitted F.R.I.B.A. on 23 June 1879, his proposers being John Honeyman, Octavius Hansard and Arthur Cates. This event may have been related to the impending publication of House Architecture, the text and illustrations of which were finalised in December of that year. Originally written as a manifesto for change in British domestic architecture, it had been somewhat overtaken by events, Stevenson observing that delays in its production had led to “many of the views which it advocates which were unusual when they were written are now current and fashionable.” Although it never reached a second printing House Architecture seems to have been influential. It largely superseded Robert Kerr’s The Gentleman’s House – of which he was critical – Stevenson observing that “nowadays palaces are generally only larger houses to accommodate a larger establishment … State and grandeur have become irksome to us and are even despised.” The book was in two volumes: the first dealt with style and the second with planning and services. A third on decoration and furnishing was planned but abandoned, partly to avoid further delay and partly in deference to Charles Locke Eastlake, until 1877 Secretary of the R.I.B.A., whose hugely successful Hints on Household Taste (1874) had reached its fourth revision by 1878. In the first volume Stevenson made good use of his European sketches, but most of the illustrations were commissioned from Henry William Brewer who drew all of them on woodblocks cut by The Graphic’s team of engravers. After a wide-ranging historical review Stevenson expressed clear preference for the earlier phases of French and German Renaissance, the architecture of Wren and the seventeenth century Oxford colleges and, predictably, the cut and carved brick vernacular classic of the reign of James VI and I in which “new ideas were adopted as new and foreign words and taken into a language of which the construction remained unchanged.” And although he had not built a house north of the Border for more than a decade, a chapter was devoted to Scotland. With his old master David Bryce four years dead, he ridiculed the big-windowed Scots baronial extravagances of the merchant and industrial classes, advocating the revival of the Scots Renaissance of the Old College of Glasgow as “well-fitted for modern houses … Its use involves no necessity of changing the existing habits of the inhabitants.” While there is no known record of Stevenson and the Wardrops being acquainted, Stevenson’s precept was so perfectly exemplified by the latter’s Kinnordy, Angus, of 1879-82 that it can scarcely be coincidence while Rowand Anderson’s abrupt switch from the Neo-Gothic of Torduff, Colinton in 1879 to the simple but carefully studied Scots Renaissance of his own adjoining Allermuir in 1880 indicates at least a sudden conversion to a similar line of thought. So far as is known, Stevenson himself never did have any new-build domestic practice in Scotland after his move to London. But south of the Border his S.P.A.B. principles had begun to emerge at least as early as 1874 when he combined 45 and 46 Front Street, Tynemouth, as The Old House for his brother Alexander: the front elevations were respected as they were, the necessary alterations and additions being confined to very traditional bay windows on the garden front looking out to sea. By the early 1880s a similar tact had begun to extend to new-build work in a historic context as at his uncompleted Third Court of Christ’s College, Cambridge, which deferred in style to the Fellows’ Building of the 1640s, while his medium-sized houses in Oxford of 1881 were a simple “William and Mary” rather than “Queen Anne.” By the mid 1880s he was adopting an even simpler approach with virtually no period detail, only fine craftsmanship in brick and timber which may have reflected his closer acquaintance with Philip Webb through the S.P.A.B. and most certainly related to his own statement in his 1877 lecture “we have no style, we only forge old ones.” S.P.A.B. principles guided his 1885 work at the Old Granary, Cambridge, where he skilfully adapted existing structures as a house for the astronomer George Darwin, but that statement found expression in his new-build houses in Cambridge later in the decade. These were a subtly composed but completely informal brick vernacular with scarcely any period detail, in their own way as original as anything by Webb. Although all quite different in their architecture, Stevenson’s relatively few public and commercial buildings reflected the preferences put forward in House Architecture, all being built within five years before and after its publication. The first and much the biggest was the long office block at 67-79 St Vincent Street in Glasgow built in 1875 to accommodate his cousin James Stevenson’s far-flung business interests, the immediate catalyst perhaps being his newly founded African Lakes Company. In deference to its neighbours it was ashlar-faced free classic with elegant details and big Lescot-type segmental pediments rising into the roof. More adventurous was Stevenson and Adams’s competition design of 1877 for Kensington Vestry Hall, tall free classic with a giant order of half-fluted pilasters, big wallhead gables and a corner cupola shamelessly copied by J.M. Monro at his Stevenson-inspired Grand Hotel in St Andrews fifteen years later. Their design was not selected but elements of it were adapted for the Orient Line offices in Fenchurch Avenue, City of London, built in the same year (1877) for the Anderson brothers of whom more below. Much simpler were the two Northumbrian commissions which came to him through his brother James Cochran Stevenson, both built in 1882-83. These were the Neo-Caroline Shields Gazette offices, brick and stone in the Chelsea Hospital manner but with a northern flavour, and the Tyne Improvement Commission Offices in Newcastle, designed in association with R.J. Johnson. Its tall five bay façade with high level arcading and an absolutely simple platformed roof anticipated early twentieth century classicism by twenty years. It had no parallel in Stevenson’s other work and may reflect the Stuart and early Georgian Palladian and neo-baroque architecture his friend and former assistant John McKean Brydon was then advocating. The main business of the later 1870s and 1880s was up-market terrace housing on the Cadogan and Hans Place Estates in Chelsea, and in Kensington, followed by similar developments on the Grosvenor Estate after Eustace Balfour was appointed its surveyor and drew up a list of approved architects in 1890. These were almost all in Stevenson’s free classic Northern Renaissance manner mainly built of brown brick with cut and carved red brick dressings. His Chelsea houses were narrow-frontage four-storey basement and attics, all basically similar in plan with permutations of bay window placement and detail so that each had its own identity within unified elevations in which wallhead gables alternated with attic and garret dormers. Much the finest of Stevenson’s developments at this time was Kensington Court for the Yorkshire mill-owner Jonathan T. Carr of Bedford Park fame. Here the houses had wider frontages and in these his Northern European studies were fully deployed to attract the wealthiest and more status-conscious clients. Kensington Court had its own electricity and hydraulic power systems, the former being provided by Stevenson’s nephew Hew Stevenson of Crompton’s. All of these developments were an exclusively London building-type with no real counterpart elsewhere, but ashlar-faced echoes of their elevations can be seen in some of Edinburgh’s more upmarket tenement blocks, particularly George Washington Browne’s 131-151 Bruntsfield Place. Kensington Court was Stevenson’s finest achievement in urban architecture, probably designed to rival Ernest George’s Harrington Gardens development, but it came at a heavy cost. Stevenson’s Macleod grandchildren are on record as having recalled that in the later 1880s he had lost heavily in property development. This was said to have been in Eaton Square where a school site was redeveloped in 1877-80, but Mark Girouard has found evidence of losses being incurred at the second phase of Cadogan Square where the houses proved slower to sell. Much heavier losses are likely to have been incurred at Kensington Court which was jointly financed by Carr, his builder Henry Lovatt and by Stevenson. In 1883 Carr formed his majority shareholding into Kensington Court Ltd prior to embarking on the over-ambitious Whitehall Court development on Victoria Embankment for which he switched architects to Archer & Green. The speculative element at Kensington Court also proved slow to sell and by 1888 Carr had lost control of both developments to his creditors. They terminated Stevenson’s services and brought in W.A. Rolfe as resident architect to complete the internal fitting-out of the houses still unsold. Venturing outwith the family circle for clients and financing them with his own money thus cost him dear at a time when he was less able to absorb the losses as a result of diminishing returns from the Jarrow Chemical Works. These resulted from the Stevensons’ failure to adopt the Brunner-Mond Solvay process. The process had been offered first to the Tennants and then to the Stevensons in 1872, but the Tennants and most of the Stevensons had baulked at the capital cost and short-term loss of income. After Brunner and Mond set up their own plant at Northwich, production and profitability at Jarrow rapidly declined, Stevenson’s share of the profits dropping to £3,000 p.a. in 1874-76. By the 1880s Jarrow had begun to be loss-making and was paying no dividend, eventually merging with forty-seven other firms using the obsolete Leblanc process to form United Alkali in November 1890. In 1888 Stevenson found it necessary to sell The Red House, and in what may have been an over-reaction to his difficulties he downsized both house and office to a three-storey semi-detached villa of the 1820s at 4 Porchester Gardens where living conditions must have been somewhat cramped compared with what they had been. But after his commitments at Kensington Court had come to an abrupt end Stevenson no longer required so large a staff. Archibald C. Dickie was senior assistant in 1893-94 implying that there were a few others and H.P.G. Maule and Thomas Ballantine were at Porchester Gardens in 1896, but any projects which required more than a very few assistants seem to have been met by outsourcing the preparation of working drawings to Francis William Troup. Troup had first gained a place in Stevenson’s office in November 1883 with the aim of studying at the Royal Academy Schools: recommendations from Campbell Douglas and the writer George MacDonald, a mutual friend, doubtless helped. At Stevenson’s Troup had worked mainly on Oxford and Cambridge projects, briefly leaving in 1886 for short-term competition work with John McKean Brydon and Rowand Anderson but returning to Stevenson’s as clerk-of-works at St John’s College Oxford in 1888-89. In the latter years Troup set up his own practice, but it is clear from his surviving papers that much of his time was spent on Stevenson projects, an arrangement which lasted until 1899 and perhaps even beyond. Stevenson had joined the Art Workers Guild in 1894. Stevenson thus had exceptional trust in Troup but there is nothing to suggest that he was involved in the design of Stevenson’s late Scots gothic churches of the 1890s. Stevenson’s earliest venture into Scots gothic had been John Reid Omond’s church at Gilmerton referred to earlier: most unusual at that time, it was probably part of his rethink of what modern architecture should be. By the early 1880s his S.P.A.B. principles had resulted in a much more scholarly approach to Scots Gothic as the appropriate idiom for church-building in Scotland. In 1881 Omond recommended him as architect for the big Free church at Crieff. This was thirteenth century in style, modelled on Dunblane Cathedral in the same county, and made brilliant use of a difficult site. For the limited competition for St Leonard’s Free Church at Perth in 1882-83 he returned to late Scots gothic and made a much more profound study of it. The success of St Leonard’s resulted in a small series of impressive churches, all in Scotland and directly commissioned, the largest being his cousin James Stevenson’s Nathaniel Stevenson Memorial Church in Glasgow. Stevenson’s most important client in his last thirty years of practice was the Orient Line whose Fenchurch Street offices have been referred to earlier. It was founded by the Aberdeenshire-born Anderson family in 1877 to cater for the Australasian passenger trade. Mary Gavin Stevenson, Stevenson’s aunt, had married the Rev. Alexander Anderson, brother of the Peterhead ship-owner James Anderson, in 1831. In partnership with their uncle James Anderson, Alexander and Mary’s sons Gavin Skelton Anderson and William Anderson had founded the line, while their daughter Margaret had married Archibald Stevenson of Jarrow Chemical Works in 1865 making the Andersons and Stevensons brothers-in-law as well as cousins. Up to the 1870s the internal fitting-out of passenger ships had been provided by the shipbuilders themselves, but for the Australian traffic the Andersons commissioned increasingly palatial state rooms, beginning with those of the Orient in 1879. Troup provided the working drawings for the Omrah in 1899 and may have had a hand in the Ophir of 1891. The other passenger lines were quick to follow the Orient’s lead but Stevenson did not derive any wider clientele from pioneering the genre. In 1896 Stevenson took into partnership the Derby architect Harry Redfern, Troup having perhaps indicated a preference for remaining independent. Articled to Henry Woodyer in 1876 Redfern had subsequently been an assistant in the office of William Butterfield and latterly William Young, provenances which may have appealed to Stevenson as fitting him for both the church-building and ship interior aspects of his practice. Although Redfern’s practice address was to be 4 Porchester Gardens, he too may have been out-stationed for much of his time to avoid intrusion on family life. He is known to have had a large hand in Stevenson’s churches in Glasgow and Stirling and in Stevenson’s London houses of the early 1900s, these now having stone rather than brick or terra cotta dressings. By the early 1900s Stevenson was semi-retired and had become absorbed in the study of classical antiquity, an interest which may have begun with the Germanically serious and very sculptural Neoclassicism of some of his ship interiors for the Orient Line. His reconstruction of the original appearance of the mausoleum at Halicarnassus was exhibited at the Royal Academy in 1906 and published posthumously as a book in 1909. Stevenson was admitted a Fellow of the Society of Antiquaries in 1884, probably in gratitude for his efforts at the S.P.A.B. Although he exhibited regularly at the Royal Academy, succeeding in having his work hung there even during the controversies of 1874 and 1877, his practice was perhaps never sufficiently high-profile for him to elected an Academician, despite being able to command the support of the London Scottish painters. Radical opinions in politics and on society which were then deemed provocative and an addiction to practical jokes resulted in Stevenson being known within the Stevenson, Omond and Anderson families as “Jaughty,” a shortened form of Naughty John. Little of that seems to have been evident within the drawing office which followed the Campbell Douglas precedent of treating the staff as an extended family. His kindness and the free use of his library were legendary as can be seen from the affectionate memoir Troup and Redfern wrote jointly for the R.I.B.A. Journal. 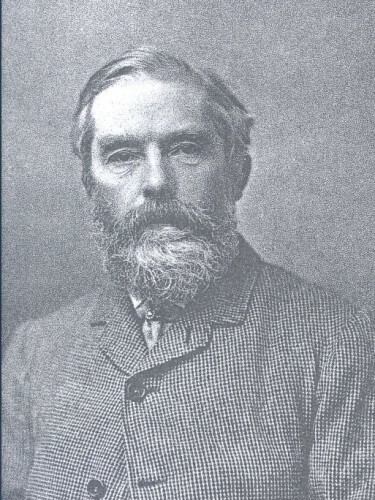 Like most of his Oxbridge clients, notably the economist Arthur Marshall, Stevenson was a Liberal: he was selected to stand for Maldon in 1874 but withdrew on being gate-crashed by a rival Liberal candidate. His views on society and the status of servants in particular may have been influenced by his studies in Germany in the 1850s, some being in evidence in House Architecture. Stevenson died at Porchester Gardens on 5 May 1908 and was buried with his father, mother and sisters in Dean Cemetery, Edinburgh. He left moveable estate of £29,912 4s. 1d., a large sum at the time but rather less than that of his sisters Louisa and Flora, both prominent educationalists. By that date Jarrow Chemical Works had closed, but the Stevensons still had significant assets in the area, comprising the Northern Press Company – as the Shields Gazette had become – and a ninety-acre site which had been excluded from the United Alkali merger in 1890. This was developed to Stevenson’s street-plan as workers’ housing for the Tyne Dock Land Company of which he was a director. The Stevensons had a family of four sons, Oswald, Gilbert, Arnold and Robert Omond, and five daughters Ethel, Emily, Mary, Mildred and Jean. Of these Oswald, Mary and Gilbert predeceased them, Gilbert’s death being the result of an unaccountable shooting incident when in the service of the African Lakes Company. Although normal enough in outward appearance, the youngest member of the family Robert (“Hob”) was mentally impaired and cared for by his surviving siblings after their mother’s death in 1932. Francis William Troup 1887 1888 Clerk Clerk of Works for Restoration of St John's College, Oxford. Assisted Stevenson from his own office 1889-1899. 1875 67-79 St Vincent Street Glasgow Scotland Conflict of information. Stevenson and 'Buildings of Scotland' give this date. However since the design was exhibited in 1866 with photo of finished building, the late date must be questioned. This needs further research. 1887 Fairlie School Fairlie Ayrshire Scotland Took an interest in the project and presented the school with an oak carving to make a fireplace. c. 1895 Fairlie House Fairlie Ayrshire Scotland Remodelling of villa - but work largely removed after a fire in the 1930s.